(Nanowerk News) A frequency comb source is a light source with a spectrum containing thousands of laser lines. The development of these sources has been revolutionary for fundamental science. It has allowed the construction of a link between the optical part of the electromagnetic spectrum and the radio frequency part. As such, it has allowed researchers to determine optical frequencies with an unprecedented precision. Amongst others, frequency comb light sources have been used in optical clocks enabling precise time keeping. The enormous impact of frequency comb light sources on science was highlighted in 2005, when the Nobel Prize for physics was awarded to Prof. T. Haensch and Prof J. Hall for their work on optical frequency metrology using frequency combs. Lately, frequency combs have been used to target more real life applications. In several experiments, it has been shown that the specific properties of the sources can be used to do fast, high-resolution spectroscopy over a broad spectrum. However, traditional comb sources are not at the right wavelength spectrum for doing spectroscopy. Ghent University, imec, the Max Planck Institute for Quantum Optics in Garching and the Auckland University in New Zealand have developed mid-infrared frequency combs, working in the mid-infrared molecular fingerprinting region of the electromagnetic spectrum. In this wavelength region, many molecules have specific absorption bands that can be used in spectroscopy to determine the presence and concentration of these molecules in samples. The researchers successfully realized the broad frequency combs, by combining the strong light-matter interaction in silicon with its broad transparency window. 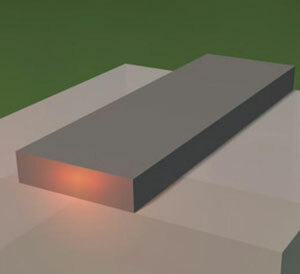 By fabricating so-called nanowire silicon photonics waveguides to confine the light in a very small area waveguide, they further enhanced the strong light-matter interaction allowing them to broaden the spectrum of the frequency combs into the mid-infrared. The achievements were possible through the use of a unique pump laser source, previously developed by ICFO, Spain. The results (Nature Communications, "An octave-spanning mid-infrared frequency comb generated in a silicon nanophotonic wire waveguide") are an important step towards a small-footprint chip scale mid-infrared frequency comb source. Such sources could act as sensitive cheap gas sensors in the mid-infrared. These would be important for example for environmental monitoring for measuring air-pollution or in medical diagnostics as a cheap tool to do breath analysis. It is worth noting that the reported work has been the result of collaboration between three grants of the European Research Council (ERC), i.e. Multicomb, Miracle and InSpectra.